The Nintendo 64 DD (short for "Dynamic Drive", Japanese: ニンテンドウ64DD, Nintendō Roku Jū Yon DD) is a peripheral released for the Nintendo 64 in Japan. 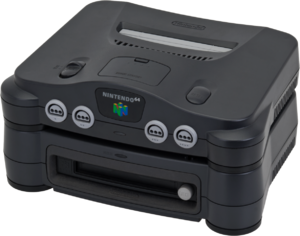 It plugs into the EXTension port at the bottom of the Nintendo 64 console and allows for the use of magnetic disks containing games, extra content, or extra memory. The Nintendo 64DD was released late in the console's lifespan and was a commercial failure. As the Nintendo 64DD sold few units, only nine games overall were released. An expansion for The Legend of Zelda: Ocarina of Time was planned under the working title of Ura Zelda, but was eventually shelved. Later, however, The Legend of Zelda: Ocarina of Time Master Quest was developed and released for the Nintendo GameCube, utilizing the same concepts originally intended for Ura Zelda. ↑ Schneider, Peer (February 9, 2001). "Everything About the 64DD". IGN. Retrieved June 12, 2014. This page was last edited on 4 October 2016, at 23:05.